I'm on a new path of possibilities. The old road I was walking was full of sadness and depression... I want to change... I seek fullfillment and joy within a simple life. I don't have answers, I don't have a plan... and since each individual is unique... I'm going to make it all up as I go. No plan = Brilliant Plan! I have managed to stay off FB. So far, so good. Keep that distraction away. I took Koda to the Cedar Creek Park Dog Run this morning. 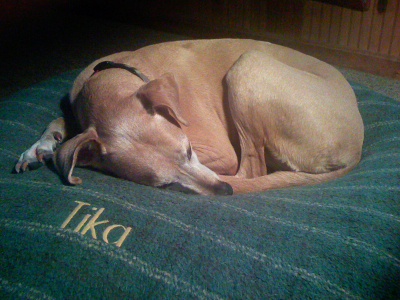 I used to take Tika there many, many years ago when she was a puppy. All this crisp and cold weather has Koda all frisky and energetic. Simple dog walks are just not enough. Today she played and ran with a bunch of other doggies. When I left for work, I'm sure she was sound asleep in her crate before I got in the car. A tired doggie is a happy doggie! I'm all signed up for the New Year's Meditation Workshop at Breathe and Flow Yoga in Freeport on Saturday, Jan. 8th from 1-3pm and will be taking my first Yoga class on Friday... Restorative Yoga. My thoughts are, for thousands of years people have been meditating and practicing yoga... It's lasted this long, there must be something to it... Time to try it out. i feel like i'm in a snow globe... can the universe please stop shaking it? Woke up a half hour ago... Oh my... the storm is still in full swing out here... The snow is swirling and stacked out there. Looks like it didn't stop all night... The tulips in the vase on the coffee table with the snow covered patio view from the sliding glass doors outside as a backdrop is an interesting juxtaposition of Seasonal Ying and Yang. Tika is presently curled up on the couch and has no interest in venturing outside... she insisted on a walk last night when I got home from work... Tika was prancing and braving the storm all bundled up in her coat... BTW... it was a quick walk!